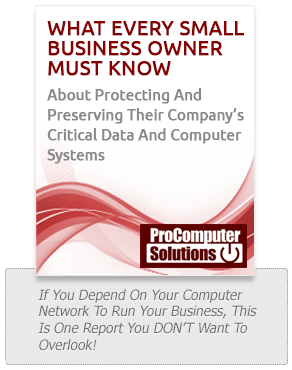 Security Audit - Kansas City, Independence, Lee's Summit | Pro Computer Solutions, Inc.
Is your network an accident waiting to happen? If you want to say goodbye to your computer problems, protect your personal and business identity and stop worrying about the security of your data from hardware failures, viruses, hackers, and other threats, then you’ll want to sign up right now for this Free Network Security Audit. Pinpoint any exposure to or risk from hackers, viruses, spyware, spam, data loss, power outages, system downtime, and even employee sabotage. This analysis will assess YOUR risk of identity theft. Review your system backups to make sure the data CAN be recovered in case of a disaster. You don’t want to discover that your backups were corrupt AFTER a major disaster wiped out your network. Scan your network for hidden spyware and viruses that hackers “plant” in your network to steal information, deliver spam, and track your online activities. Look for hidden problems that cause error messages, slow performance, and network crashes. Answer any questions you have about your network or keeping it running problem free. We can also give you a second opinion on any projects you are considering.